Is it time for you to make a list and check it twice? No, we’re not discussing a “naughty or nice” list but a moving list. If you’re looking towards moving into a new home or apartment in the New Year then you should be well on your way to packing up. The earlier you can start the packing phase the better off you’ll be in terms of your stress levels. This doesn’t mean you have to pack up everything in a day but if you’re weeks from the big move day you can start with small things like a bookshelf a day or a cabinet a day. Before you know it you’ll have everything you need ready for the movers. The thing to make sure is that you label those boxes not only with the contents but also where is will be going in your new home. The easier you can make it for the movers the better off moving day will be. It will also be less expensive because once the movers show up the meter starts running. If they have to waste time carrying boxes from room to room you’re going to end up getting a bigger bill then you expected. Another way to save on moving expenses is to actually have a junk removal day before the actual move day. This is where you’ll be getting rid of all the junk you’ve noticed you’ve collected over the years. It’s when we’re forced to pack up everything that we realize just how much junk we’re hanging onto. You certainly don’t want to start a new life in a new space by carrying all that old junk with you. You don’t have to when you hire Junk King Raleigh for the removal chores. With Junk King Raleigh helping out you won’t have to fuss with renting a truck; that’s part of the deal. You’ll also be getting a two-man crew to do all the backbreaking work of lifting and carrying your junk. But don’t feel guilty: those crews are professionally trained to haul heavy objects and think nothing of moving a sofa or fridge. 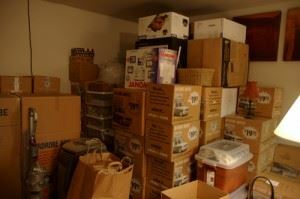 As you pack, you could start to build up a pile of your discarded stuff for the Junk King removal. But even that is more effort then you need to exert. The Junk King Raleigh crew will go where your junk is whether that’s down in the basement, up in the attic or out in the garage. Just tell them what you want removed and they’ll handle the rest. It couldn’t be any easier! This entry was posted in Junk King Raleigh, Raleigh Junk Hauling, Raleigh Junk Removal, Raleigh TV Disposal and tagged Junk King Raleigh, Raleigh Junk Disposal, Raleigh Junk Hauling, Raleigh moving tips on December 20, 2012 by Britt Holcomb. Last updated August 1, 2017 .